National Instruments has introduced two system expansion options for creating multichassis PXI Express systems. The NI PXIe-8364 and NI PXIe-8374 are the first NI PXI Express remote control modules that make it possible for engineers to directly interface multiple PXI Express chassis to a single host computer using any expansion topology, without requiring complex custom solutions. The modules’ simplified interconnectivity and industry-standard PXI-based architecture help increase system design efficiency and overall system performance in a variety of high-channel-count data acquisition and high-speed automated test applications including RF and semiconductor test. The NI PXIe-8364/74 modules use x1 and x4 MXI-Express links, respectively, to connect downstream and upstream PXI Express chassis, and all PXI modules in the downstream chassis appear as local devices in the upstream chassis. Because MXI-Express links are software transparent, no interconnections require programming, which greatly simplifies multichassis system setup. Additionally, the modules use cabled PCI Express as their underlying communication technology, which offers extremely high bandwidth and low latency. The NI PXIe-8364/74 modules provide a maximum data bandwidth of 250 MB/s and 1 GB/s, respectively. Engineers can use the new modules to create systems with multiple PXI Express chassis connected in complex topologies such as star, line or tree. Ideal combinations connect the new NI PXIe-8364/74 modules in upstream chassis with NI PXIe-8360/70 controllers in downstream chassis. With their PXI architecture and cabled PCI Express communication technology, the new expansion modules build on the numerous National Instruments offerings of broad compatibility with the highest industry standards. Such compatibility, combined with the new modules’ features, simplify the process of expanding PXI Express systems to include multiple chassis for higher performance, thousands of data acquisition or measurement and control channels for various test and measurement applications. 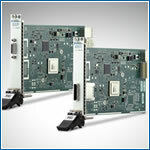 Readers can learn more about the new NI PXI Express multichassis system expansion modules by visiting www.ni.com/mxiedc.